A few years have already passed since then and, in fact, when it comes to digital textbooks, we can find some alternatives that approach, in one way or another, these ideas. However, in view of technological advances in other areas, there is still a perception that there is still a long way to go to have digital textbooks that genuinely bring about a great improvement in teaching practice. In order to identify this “path to follow”, in this article we will briefly review the concept of the digital textbook and discuss its current situation and future prospects. What is a digital textbook? As a first approximation it is important to point out that, even sharing characteristics, a digital textbook should not be confused with what we popularly know as an e-Book. PwC defines it as ‘digital versions of printed books which are distributed over the Internet. These files can be read in e-readers, tablets, personal computers, smartphones and also on some mobile phones”. Although in both cases we are referring to digital reproduction media the fact is that a digital textbook should not remain a simple “digital version of a printed book” (digitalised or lay-out textbook). Ideally, it should go far beyond this and offer a digital framework with greater visual impact and interaction capacity (interactive book or multimedia) or, at least, make a minimal use of technology to link up other content (external or internal) and offer some additional features such as underlining or annotations (enriched book). It motivates students to study and helps them to learn due to the diversity of digital formats that adopt its contents. It helps to understand concepts through different languages with a great didactic potential, such as audiovisual or interactive. 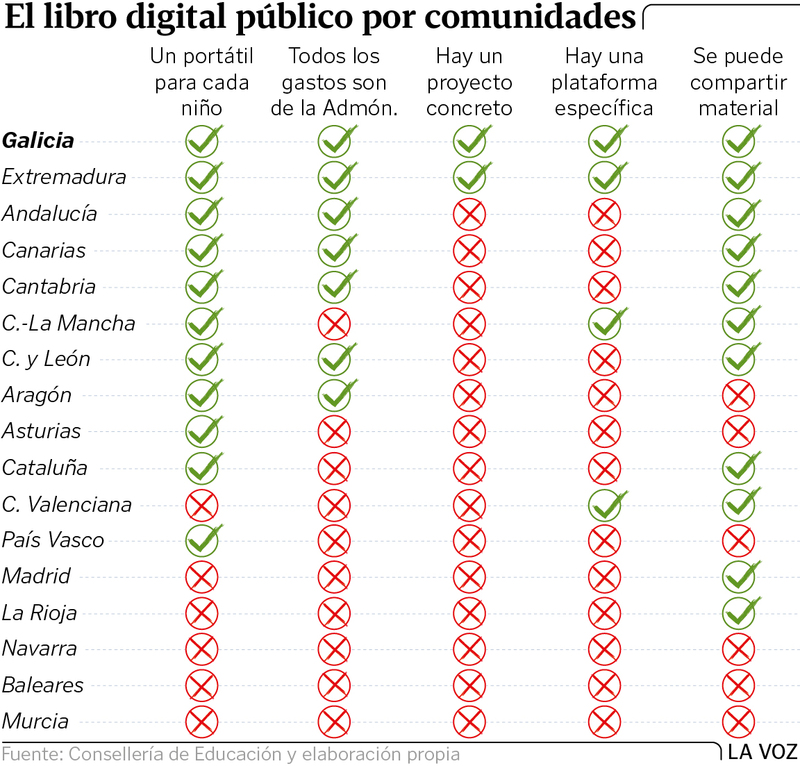 Improvements in school technology infrastructure, student computer equipment and, in some cases, regional administrations’ bets have led to the introduction of the digital textbook into the classrooms in Spanish schools. 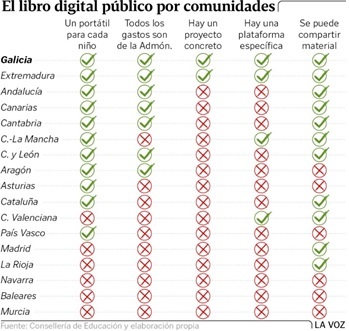 As a result of the E-DIXGAL – Xunta de Galicia project we can say that Galicia is at the forefront of the implementation of digital textbooks in public education. Launched by the Regional Ministry of Education in 2014, this project complements Abalar programme and aims to promote the widespread incorporation of information and communication technologies (ICT) in the development of educational activity, making available to schools a virtual learning environment (VLE) with digital textbooks and other materials with the purpose of developing the entire curriculum of the 5th and 6th grades of Primary Education and 1st and 2nd grades of Secondary School. EVA’s project is completed with tools that allow students to monitor their activities, create new digital content, communicate with other members of the educational community, etc. Currently, it has three suppliers of educational material: Edebé, Planeta (aulaPlaneta) and the Galician publishing house Netex, a client and strategic partner of Gradiant in various projects related to the modernization of digital content and the analysis of learning in school, university and corporate environments. Nowadays, 154 schools and 11,600 students from 5th year of Primary and 2nd year of Secondary Education are incorporated to the E-DIXGAL project in Galicia. Renovation of 13,000 netbooks (“digital backpack” for students) has just been completed giving them access to all educational resources in this format in and out of the classroom. As part of the Galician Strategy for Digital Education, edudixital 2020, the E-DIXGAL project aims to reach 300 schools and more than 20,000 students benefiting from the digital book over a three-year period. Although we are still in mid-transition between the traditional model and the digital model, practically all the publishers that play in the national market have launched their approaches. Following is a list of the main characteristics of some of them. Of course immediate future in the context of the digital textbook is to leave completely the digital textbook model and / or supplemented by a fully interactive model that empowers teachers and students in their learning process. To give the contents the autonomous capacity to analyze the learning process of the students and to give feedback in real time to the instructor by means of the application of learning analytics and big data techniques. Design of analytical-predictive techniques that, starting from student-book interaction, generate alerts about problems in the understanding of the subjects and/or competencies dealt with. Integrate within the content an environment of co-creation for the instructor that allows for personalization and the addition of instructional elements that favor attention to diversity and personalized education. The most important proposal here is to improve the student’s motivation through the projection of the student as an active user capable of building his or her own book, playing games and communicating with others through it (i.e. gamified environment and student authorship). In this project, one of the work packages is aimed at evolving the concept of content factory to optimize the return on investment in digitization and facilitate the digitization and mass production of digital content in narrow time frames.